The package being offered will come with a full ONE YEAR (365 Full Money Back Guarantee) is Instantly downloadable to their computer and contains over 100 Hrs of Video, 50+ hrs of Audio and all the manuals, business templates and such anyone will ever need to be a TOTAL SUCCESS in the fields of Hypnotherapy – NLP – Stage/Street Hypnosis – Psychic Readings – Past Life Regression and many others. The site launches on Monday 21st November at http://www.elitehypnosisbootcamp.com/ with Five Days of 100% FREE training videos (over 6 hrs of amazing content) to give people a real idea of how valuable the package they will be offered truly is and can be to them! CONTACT ME NOW for full details of how to become a Joint Venture Partner and make some serious $$$/£££ in the next few weeks! DERREN BROWN – THE EXPERIMENTS – ASSASIN – CAN HYPNOSIS KILL ??? Some of you may recall that Derren Brown did something that looked exactly the same on his “Messiah” show, anyhow my colleague had tried to perform this in the past with limited success and was asking me how it was possible to get this to work the Majority of the time and that’s why I am now posting this report. It seems that many members of the Magic and Mentalism Community are constantly arguing that Derren does not use Hypnosis and NLP techniques as often as it would appear, and at the same time many members of the Hypnosis and NLP World are believers that Derren does indeed use far more of their techniques than anyone realises. Well my opinion (and experience of filming TV Shows in the past around the world) is that Derren does indeed use Hypnosis and NLP techniques Far, Far more than the majority of Magicians and Mind Readers actually realise or care to admit. Later in this article I have republished a section of a report I did in 2010 after Derrens “Hero At 30,000 Feet” show which illustrates exactly how the entire shows success was (in my opinion and past TV experience) due entirely to Hypnotic, NLP & other Purely Psychological Manipulation Techniques. When you have read that section of this report, I am sure you will start to realise just how often Derren does indeed use such techniques during the filming of his Television shows and often at some level in his live shows also. You have to consider that one hell of a lot of pre-show work takes place and for a full understanding of “Pre-Show” I truly recommend you to read “The Gift” by Paul Brook – http://www.paulbrook.co.uk/heknows/thegift.htm – for example if you were to hypnotise someone (very easy to do if you follow the process outlined later in the “Hero At 30,000 Feet” report) prior to the filming beginning and were to give them Post Hypnotic Suggestions to react in a certain manner, say or do a certain thing etc upon a given verbal or non verbal cue then indeed they would do and when the cameras were to start rolling and these things occurred without any apparent hypnosis (as you never get to see that take place) then it would indeed look like a True Miracle. The point is that I have tested this out in the real world and trust me, not only will people react to Post Hypnotics given prior to the filming taking place so that people who watch the TV footage think its mega amazing as they are not aware that the person has been hypnotised and told how to react, but also once someone has been hypnotised its possible to tell them that when they open their eyes whatever you tell them will occur whilst their eyes are open will indeed occur for them as 100% total reality. They can be told you have turned invisible, or that they are getting drunk on Alcohol when they are drinking fresh air or ordinary water, these are just a few examples of routines that Derren has indeed done on his show which work purely by Hypnosis and/or NLP Language Patterns. People can forget their names or the name of where they are going on the tube, Taxi Drivers may forget hwo to find somewhere – these are all low level hypnosis stunts which often can easily be achieved without the need for a formal induction process – so called “Waking Hypnosis” but are even more reliable when an induction procedure and selection testing has been done in advance as explained in the “Hero At 30,000 Feet” report below! Well there was no pre-show of that I can assure you and the person had not been hypnotised in the conventional direct sense in advance to do this. However he was sat in a seminar room having paid a lot of money to be there and so awe rapport and other psychological elements that are mentioned later were indeed firmly in place. So already he had in his mind a mental image that when I get people to stand with their feet together, heel to heal with their hands by their side that I am about to do that technique on them and so his mind would have been wrapped around the idea of falling backwards. Further because I got him in position and did not say the same things as he had seen before there was a level of confusion, disorientation and bewilderment taking place which arguably placed him into an instant trance state. In my mind I knew it was just a matter of time before he would fall backwards and so as you watch the video – http://www.youtube.com/watch?v=eMEdvfcUNDI you will notice that I have my hand in such a position that I can pull it towards myself when he moves backwards, however people perceive it as me making him fall backwards by moving my hand, the truth is I am waiting for him to fall backwards and then start to move my arm to make it look as though my arm movement is the cause for him falling backwards. Another thing to consider is that the wall he was facing (due to the lighting) was such that as he looked at it he would have seen the shadow of my arm reaching outwards and that in itself is a non verbal suggestion that I am going to pull him backwards in a similar manner to the dropback induction that he had witnessed on someone earlier. I also imagined myself reaching forward into his body and grabbing his stomach area and pulling it slowly towards me, I know that sounds a bit science fiction but its good for my facial expressions (from a method acting point of view) and well if there is anything in “energy” work then just perhaps that also helps it work even easier? Also what is not obvious on the video is that as I am stood behind him I am breathing inwards, in otherwords I am taking a big deep breath inwards so that air moves towards me as does the sound of me breathing inwards move towards me and that acts as a low level sound suggestion for him to move in my direction. Oh and when I had breathed fully inwards I held my breath which would confuse him and make him more lightly to lose his centre of balance as he perhaps started to wondering why he could not hear my heavy noisy breathing anymore! All of these elements come together to make this a very reliable technique indeed, however some may wish to cheat a little more in which case you could either use someone who had been pre-hypnotised and inform them that when you coughed they would fall backwards into your arms, this cough being quite quiet so the audience don’t pick up on it and as they have not seen you previously hypnotise the person they will be amazed. Or in conjunction with all of the things that I have already mentioned when getting them to stand up straight you could leave a length of invisible thread over their shoulder which is furthest away from the audience (see video again http://www.youtube.com/watch?v=eMEdvfcUNDI ) so that when you release the reel which has been slowed down so it winds the thread in very slowly compared to normal, they will suddenly feel something move along their shoulder area and over their skin and then behind them. Obviously in this case you need someone like I used on the video who is wearing clothes that will allow the thread to come into contact with their skin and thus act as a non verbal suggestion to fall backwards, indeed they may perceive having seen the dropback induction earlier that its you pulling them backwards, but either way the sensation will be weird for them and this add a major level to helping make them fall backwards. I made my reel which on occasion I have used from a hand held pocket battery operated fan and a cotton reel and some hook eyes which are used to help slow down the pulling of the thread back into the reel. Anyhow consider all of the above and also the report that follows and you may well start to realise how much Hypnosis, NLP and Psychological Manipulation techniques are actually used in much of Derren Browns TV work! Firstly Derren’s production company advertises to find people who are both suggestible, easily manipulated and essentially would do pretty much anything to get their face on Television and to meet their “idol” Derren who they most likely already have a level of Hero Worship for, in otherwords those who apply will mostly always already be in “Awe Rapport” and their levels of Belief and Expectancy in Derren’s abilities to “control” their minds will already be firmly in place. This important element of Belief, Expectancy, Prestige, Perception and Hero Worship of a Celebrity and/or fear/respect for Special Powers of Mind Control which is what they are looking for people who are in the state of mind that they believe in “Special Powers” are not to be underestimated. Any Experienced Stage Hypnotist should already understand the importance of these elements and how when they are in place it is quite literally possible to get anyone to do anything even if it would normally contradict their morals or their values, yes I am going on record and stating that done correctly with hypnosis and hypnotic techniques you can quite literally get people to do anything and everything that you could possibly ever think of. Those who state otherwise either are downright liars, have been brainwashed into thinking this is not true by the people who taught them or frankly don’t have enough real world experience of what is truly possible using Hypnosis, Hypnotic Techniques and Real World “Brainwashing” methods. The psychological context which is created and which those who apply are already in is vitally important to the success of a show such as Derren Brown’s “Hero at 30,000 Feet” – its much the same as the fact that the pre-show advertising for any Stage Hypnotist Show is just as, if not more important than any other element. Adverts such as this which appeared on Derren Browns own blog – http://derrenbrown.co.uk/blog/2010/04/take-part-in-my-new-show/ are used to get people to apply for a show where they are not even given any idea when applying what the show is about. Automatically people will be curious, and only those who already desire fame and/or a chance to meet Derren Brown will apply and these people are already arguably 99% hypnotised before Derren Even ever gets to meet them in person and so to manipulate them and the situations they will be placed into becomes as easy as 1,2,3. Another example of adverts used to attract participants are – http://www.channel4.com/microsites/T/takepart/derrenbrown.html – again nothing is revealed about the nature of the show and that starts the psychological selection process of finding a highly suggestible and easily manipulated individual. Those who apply will be sent out a questionnaire style application form, which will be a cross between a Psycho-Metric evaluation test and a job application form, structured to make them aware at this stage that they are applying to take part in a game show to be presented by Derren Brown. At this stage they are now psychologically entering into a competition with other applicants, other people they have not even met and in their own minds are already competing with to try and get through to the next stage. They’ve been dangled the carrot of appearing on TV, they have the carrot of meeting Derren Brown, they have the carrot (in this example) of winning a Dream Holiday and £10,000 cash, and of course their ego is already being manipulated and thoughts of “am I good enough” to get through to the next round will be entering their mind. The application form will have strict rules on it, for example some sections may say complete in Blue pen only and others complete in black pen only. Some sections may well say Complete in Block Capitals only and other sections say use lowercase text. This will be done to both on a low level disorientate and confuse the person (which places them into a level of trance and starts the fractionation and conditioned response process which by virtue of Derren Browns name being connected to the application form means this becomes anchored and associated to Derren Brown thus making it easier for him to hypnotise those who are truly suggestible when he meets them) and also is done to see how obedient these people are to instruction and how Eager they are to please Derren Brown and his production company and how eager they are to take part. Now imagine if right from the start the application forms said a one off pilot show for a new game show series was being made with Derren Brown as presenter and that only ONE person will get the chance to take part in the Pilot show which they are led to believe will be broadcast on Channel Four in order to see how popular it is with the general public with a view to the series then being commissioned. This would have put the person in the position of feeling that they would be incredibly LUCKY if they are the “chosen one” and then later if they do become that “Chosen one” this feeling of being special, makes them feel loved, wanted, needed, appreciated, cared for and cherished on many psychological levels and they will want to THANK the person who has made them feel this way, in this case Derren Brown and his production company. So suddenly they are in a psychological situation of being totally compliant to Derren and whatever he may suggest, they also have a feeling on some unconscious level of great responsibility to help make the show work well as they currently believe it to be a pilot for a TV Game Show, and are led to believe that a decision on whether to make it into a full series is down to how well the pilot is received. Therefore this situation itself contains within it the suggestion that they personally are responsible on some level (eg how well they participate) for the success of the show and for whether their Celebrity Idol Derren Brown who they respect, admire and Believe to have “Mind Control” powers gets commissioned to make a full series or not. Very quickly a similar psychological situation to that which exists between a Cult Religious Leader and his followers has been generated and can easily be manipulated to quite literally get the most suggestible to do most anything you could ever dream of. I’d also suggest that you read the excellent book “Influence – The Psychology of Persuasion by Robert Cialdini” – http://www.amazon.co.uk/Influence-Psychology-Persuasion-Robert-Cialdini/dp/006124189X/ref=sr_1_11?ie=UTF8&s=books&qid=1284297851&sr=8-11 and also take a close look at The 3 main experts in Behaviourism Psychology namely – Ivan Pavlov, John Watson and B. F. Skinner. Frankly if you study the works of the people that I have already mentioned above and use a small amount of common sense then you would now be in a position to realise that despite what some so called experts say, it is indeed possible to use these psychological manipulation techniques and insights in such a manner as to be able to make most anyone do most anything, even if usually it would have contradicted their morals and/or values. Hitler himself and his associates are a prime example of manipulative psychology at work in the real world, most are to scared to admit the facts, but the fact is and the truth is that people can very easily be manipulated to do most anything and indeed this can in reality be done in such a manner that they have no real knowledge and/or recollection of how they were made to do those things, and indeed just find that they feel compelled to do these things without question. Cold-Reading is another wonderful technique which in interview situations can easily be used to give the impression that you know far more about the person in front of you than you really do, or indeed should be able to know based on the information they completed in their application forms. So the persons desire to take part in the show leads them to apply and they make a commitment to the process by taking the time to complete the form and return it to the production company, this process alone has already started to manipulate and condition them to do whatever Derren Brown should later suggest. Its my educated opinion that these application forms are then studied and a small number (say 20 for example) of those who have completed them correctly (and so followed all the confusing instructions) and who have answered the Psycho-Metric element of the questions in such a manner as to illustrate their pre-disposed compliance to authority figures and suggestion etc are then invited to an audition day. For obvious reasons all who attend will be subject to a legal notice of non disclosure, and anyway at this stage will be in a category that they are so easily manipulated that those who are not chosen on the day to be “the special one” can be made to “forget to remember and remember to forget” pretty much everything that took place anyway, or made to remember it and relate it to others in a manner which bears little if any resemblance to what really occurred. Initially at this audition day the group of (in our example) 20 people who have been selected will be put through a whole host of suggestibility tests as a group so that there is still the element of competition in play and also the elements of group social psychology come into play also. A certain number will then be dismissed in order to make those who remain feel “special” and “Lucky” that they are through to the next stage. Further suggestibility tests will be done with these people, and also exercises such as those used in corporate team building to see which of the people are naturally most compliant and responsive to instructions and suggestion. A further number will then be dismissed so those (lets say now about half so 10 people) will feel even more “special” and “Lucky” to have got this far. At this stage everyone would be hypnotised, the trance deepened and as a group they would be put through various tests whereby they would be given suggestions whilst in trance such as it being a hot day, then a cold day etc and their level of responsiveness and reaction to hypnotic suggestion would be observed. After this I’d guess that around half of them are dismissed (in our example that leaves 5 remaining) so that the 5 remaining by now feel that success is in sight for them and that their “dreams” to take part and win the prize etc could now seriously come true for them. This process has conditioned them that being responsive and obedient to whatever Derren Brown says is the key to their success and this will have sunk In to such a level that they will now be doing things both in and out of trance that Derren Brown suggest without even giving the suggestion a second thought, they are now essentially “brainwashed” and “obedient” to their “leader” Derren. The five remaining will be brought out of trance and then re-hypnotised several times in order to fractionate them to such a level that it is firmly established that they are quite literally under Derren’s control by this stage of proceedings. At this stage each of the five people will be taken off into different rooms and social psychology experiments such as the smoke under the door (which we did see on the show) will be conducted with them out of trance to see which of them react submissively and further illustrate they are one of the “sheep” so to speak, rather than someone who would question things or resist at a later stage. Once all this has been done a clear winner will have emerged In the eyes of Derren Brown and his production team and that person will be decided upon by them along perhaps with the second best person (as back up just in case). The other 3 will be dismissed but this will at this stage be done in such a manner that the two who remain have no idea at this stage that the others have been dismissed and that they have been earmarked to be the star of the show. In otherwords they might tell all five of them that they have all done very well and over the next couple of weeks videos which were taken as they took part in the days experiments will be watched over and a final decision on who will take part will be made in a few weeks time. This leaves them all (especially and most importantly the ones earmarked to take part) in a state of anticipation, they are now so close to achieving what they set out to do and yet so far at the same time. Obviously all consent forms and legal stuff will have been signed and all legal permissions to film them in any manner (including secretly) will have been signed away by the people by this stage so that the rest is now relatively easy. At this stage the person who will actually be used for the show is so fractionated that whenever Derren Brown says “Sleep” to them they will re-eneter what they perceive and believe a trance hypnosis state to be and they will become instantly compliant to his each and every suggestion and command. Now as for the rest of the show, the simple fact is that it would have been impossible due to time constraints for Derren to include everything that went on to achieve the end outcome and the steps along the way. However from experience I can tell you that everything he did on that show is without doubt achievable and possible by using Hypnosis, Brainwashing and other Psychological manipulation techniques. Yes of course there were elements that were not broadcast or shown (such as everything like people being hypnotised at the audition process etc) and other times when I’m sure Derren would needed to have placed him back into trance and deepen him further and/or fractionate him more, but at the end of the day everything he did was and is possible using Genuine Psychological Means. Another Psychological element to consider is that whether consciously or unconsciously (that’s another debate entirely) the guy would have had Darren’s Words and suggestions (which we heard on screen) of making it real of going into a Policeman’s house etc, ringing in his ears when the opportunity arose. And of course no doubt off camera a suggestion was given to him whilst under hypnosis that he’d feel the absolute desire, need, want, craving and compulsion etc to enter the house and make himself feel at home. These suggestions whilst being abided by and responded to on the one hand, would also prove reassuring on another due to the context of taking part in a Derren Brown Gameshow scenario. In other words his mind would be telling him there is nothing legally or morally wrong on any level in going into the Policeman’s house and doing what he did. That’s the key to Brainwashing and being a Cult Leader etc as explained in Delavars books THE HYPNOTISTS BIBLE – its to make the person believe that what they are doing is completely normal, legal, moral and safe, when in truth the reality can often be disturbingly directly the opposite, that’s how Cult Leaders get their disciples to kill themselves in mass suicides and it’s the same kind of techniques which are being used here, but for the purposes of entertainment and also to help empower the person in their life. Its all about context and conditioning, for example hypnotise someone and tell them they will wake up and pick up a gun and go and shoot someone and they won’t if it’s against their moral code and deemed by them to be wrong. However suggest to them they are in their minds 6 years of age and that they are playing cowboys and Indians and that when they are awoken they will pick up the toy cap gun on the table in front of them (which could actually be real) and they will go and kill the big bad chief Indian who is dressed in (detail of victim given) and is currently hiding at (their location given) and it becomes very possible indeed to create a context and state of mind where it feels and seems to be perfectly acceptable, safe and logical to do exactly as they have been instructed to do. This truly is the tip of a huge iceberg and I sincerely recommend that you look at all the links given in this report and read all of the books that I’ve recommended as then you’ll truly start to understand that what I am stating is not science fiction rubbish. Yes there was stuff done before the cameras started rolling of that I’m sure, and yes elements of Dual and Multiple Realities were I am sure used, for example its easier and safer to take someone who is scared of flying, use NLP and Hypnosis to CURE their Phobia and then for the purposes of filming (to ensure that no unexpected or dangerous health issues occur) instigate a Hypnotically suggested fear of flying which will automatically be cancelled out for good when Derren awakes them from Trance fully at the end of the final show. When you consider everything I have said here along with Derren Browns own comments on his own blog here: http://derrenbrown.co.uk/blog/2010/09/hero-answers-questions/ and you’ve read the books and information available at the links that I have given then I am sure you will realise that Everything on the show was indeed possible due to Hypnosis and Psychological Techniques. I covered many of the psychological manipulation techniques and triggers used for such shows made by Derren Brown during my 3 day London Intensive Training Seminar on all areas of Stage/Street Hypnosis and also NLP, Hypnotherapy and related techniques. I usually sell this bumper training package for £197 at this link here: http://www.magicalguru.com/ultimatechange.html and as you’ll see by looking at that link it does indeed cover all of the elements I have been talking about in this report along with many other essential elements which I feel certain will have been used by Derren and his team during the making of this show and also during the making of many of his past shows. For a Limited Time Only and as a way to introduce you to the unrivalled quality and content of our training packages we are offering you the chance to grab Over £1,500+ of Video, Audio & Written training materials at a tiny fraction of their usual retail cost. As stated if bought separately the contents of this bumper package could easily cost you in excess of £1,500 if you had to buy all of the items it contains at their usual separate retail prices. You’ll learn all areas of Clinical & Medical Hypnotherapy – Neuro Linguistic Programming (NLP) – Complete Mind Therapy (NLP) – Comedy Stage Hypnosis – Street Hypnotism – Magic & Mentalism, along with the True Inside Secrets of Making Big ££/$$ Money from your new talents! Now Take a closer look at just some of the things that are included in this bumper special offer package. This amazing home study course comprises of almost Twenty (20) hours of instructional videos teaching you in a simple step by step manner everything that you’ll ever need to know in order to become both truly confident and highly competent in all areas of Hypnotherapy – NLP – Complete Mind Therapy and even all areas of Stage & Street Hypnosis. Whilst this package will take even the Novice to Advanced Professional Standard with ease, we can guarantee you that even the most established Professional will learn numerous invaluable new Techniques, Secrets, Strategies and Ploys from this package. This is the amazing home study DVD training course starring Robert Temple and his original Hypnosis tutor Jonathan Royle. Of this package Top USA Hypnotist Richard Nongard has said “Robert is a skilled hypnotist, who presents his ideas clearly. Despite his youth, his stage persona and experience shine through. His ideas, like mine and others, are influenced by his teachers and adapted by his own style. Anyone who buys this for the price they are selling it at will have some very useful material to help them become a great hypnotist. JR does a good job of interviewing, and adds some thoughts that are quite valuable.” – Richard Nongard, USA” – There are several hours of mindblowing video training in this package which will take even the complete beginner to Advanced Professional Standard with ease. Not only will you personally learn all of the shortcut secrets to success in NLP, Life Coaching, Presentation Skills and 13 other high in demand topics, but also you’ll get all of the Power-Point Presentation’s, together with the running orders, course handouts and back up training materials to enable you to use this bumper package to present your own one or two day live training events for both the corporate and public arena in any one of these 15 subject areas. You’ll get the audio recordings of this 3 day long (approx 18+ Hours) London Hypnotherapy & NLP training seminar presented by Jonathan Royle. During the 3 days he also teaches many inductions and techniques of invaluable use to all Stage & Street Hypnotists. Many people have paid as much as £197 for these audio recordings alone, but as part of Royles Birthday Offer, you’ll learn all of the secrets at no extra cost to yourself..
You’ll get the entire Mobile Magic Package – the only difference being that you will only get a total of Fourteen (14) gimmicked Disks along with the Two (2) Normal Disks. However you can still perform all of the material explained in the instructions with ease! Whether you’re a Hypnotherapist wanting to speed up your work or do public group treatment sessions, or you’re a budding (or even established) Stage and/or Street Hypnotist, your guaranteed to learn many invaluable techniques from this amazing package which contains all of the stuff you need to know for success. This amazing One Hour instructional video will teach you numerous suggestibility tests (set pieces), more Rapid and Instant Inductions than you’ll ever need to know and indeed absolutely everything from A thru to Z enabling you to perform your very own Comedy Stage Hypnosis Shows. This is a complete package of Software, Copyright Free Music and Sound Effects, Instructional Materials and Scripts to help any Hypnotist make big money from merchandising, check out the full details of what you get in the fuller description of each item later in this listing. If you’ve ever wondered how the Television Psychic’s perform their miracles then this is the training manual for you! You’ll learn the art of Cold Reading for the real world and enough Mentalism Routines to perform an entire show. Whether you’re interested in learning the true inside secrets of the worlds leading Pick Up Artistes or you just want to learn techniques which will make you far more charismatic and likeable as a Hypnotist, Magician or Psychic Entertainer then this is the book for you. This is perhaps the ultimate ebook on the legendary “Berglas Effect” and has received rave reviews from many top names including Marc Paul. Some sections of this material also recently appeared in “Killer Konceptions 2010” publication. A must read for every magician and mentalist. A modern day variation of the classic Any Card At Any Number Magical and Mentalism Plot. Check out the performance video and decide for yourself how impressed your audiences will be when they see you perform this miracle. This publication details an entire Psychic Style Mentalism Routine that is big enough to play on the largest stage and yet all the props will easily fit into your jacket pockets. This is truly the pack small and plays big miracle routine comprising one mind boggling effect after another that you’ve been searching for. Not only does this contain Jonathan Royles amazing True Life Story from the ages of birth up to 30, but also you’ll discover how he managed to obtain Extensive Worldwide Television, Radio, Newspaper, Magazine and Internet Publicity for his acts and talents enabling him to socialise with some of the world’s biggest celebrities into the bargain. Discover how you could do the same to. This Ebook by Jonathan Royle teaches you enough secrets of Dual & Multiple Reality Trance Illusions and so called Hypno-Tricks that after reading it you could present an entire 90 minute hypnotic style show without ever needing to place anyone into a Trance! You’ll look like a Master Hypnotist in no time! When you’ve studied the contents of the videos, audios and manuals within this bumper package you will then also discover how (without having to pay us any extra money) you can get your hand on a total of TWENTY (20) yes that’s right 20 Professional Hypnosis & NLP Diplomas and Certifications. Others have paid as much as £127 for this service alone, but you’ll get access to all 18 diplomas mentioned later in this listing and also Two New Diplomas in Neuro Linguistic Programming, once you have studied the contents of this bumper package (exam papers included) without you ever having to pay us another penny! * Earn a Certificate in Indirect Hypnosis, Ericksonian Psychotherapy and NLP for free. Over 40 hours of streaming video demonstrations of clinical hypnotherapy with real patients including running commentaries by your course tutor. 100 interactive hypnosis forums covering every latest technique, skill and theory. Highly comprehensive leading-edge Ericksonian Syllabus. 100 ongoing graded weekly student assessments with feedback. Choice of over 200 interactive assignments throughout the course. Lively ongoing weekly assessed online discussion groups. 6 live chat rooms for shared exercises and assignments. Course designed and taught exclusively by the worlds leading authority on Indirect Hypnosis. Additional Supervision from experienced medically trained Doctors expert in hypnosis. Hands-on advice on Indirect Hypnosis and Neuro Linguistic Programming. Course designed and built using the Open University online distance learning platform. Includes Practical weekly online interactive lessons and assignments in Indirect Clinical Hypnosis, Ericksonian Psychotherapy and NLP. But you’ll also gain access to Fourteen (14) Hours of Audio Neuro Linguistic Programming (NLP) which can instantly be downloaded 100% Free from the website link that we provide.. Links to a web page where you can instantly download Five (5) amazing training manuals on Covert & Conversational Style Hypnosis and Hypnotic Language Patterns will also be found within this package, as will access to several other hours of Audio Tuition in various areas of Hypnosis. *Where to obtain the correct “In Trance” Public Liability & Professional Indemnity Insurance for Stage Hypnotist’s performing in England and Europe and USA. *Where to obtain Insurance for Stage Hypnosis and Street Hypnosis (for both indoor and outdoor venues) which will enable you to get licenses granted in England (UK) for as little as £150 per Year and where to get such cover in USA for as little as $350 a year. *Where to obtain the correct Public Liability and Professional Indemnity Insurance Cover for working as a NLP Hypnotherapist and Life Coach in England (UK) as cheaply as £50 per year and where to obtain it at the most competitive rates anywhere else in the world. *How to put together a Legal Health and Safety “Risk Assessment” document for your Hypnotherapy and/or Stage/Street Hypnosis business. *All of the legal considerations (information included for various countries around the world) that need to be considered and taken care of by any Professional Hypnotherapist and/or Stage/Street Hypnotist. *How to Make An Absolute Fortune from all areas of Hypnotherapy, Stage & Street Hypnosis and even Magic & Mentalism with relative ease. Your copies of everything as detailed above, along with numerous other valuable training materials and bonus items will be sent to you by First Class or Airmail Postage anywhere in the world for one low “Special Offer” price. Only a limited number of these packages will ever be sold at this crazy discount price of just: £47-00 UK Sterling. YOUR FREE GIFT WHEN YOU ORDER TODAY.. When you send your £47 Sterlingtoday via http://www.paypal.com/ to course@magicalguru.com we will also send you FREE OF CHARGE as a part of the package.. This is the book mentioned several times in the report about Derren Browns “Hero at 30,000 Feet” and Not only will you get the original version of Delavar’s amazing training course but also you will get the expanded versions previously unavailable containing Secrets, Ploys and Techniques which have never been published before! SOME OTHER INTERESTING LINKS ABOUT DERREN’S SHOW – HERE AT 30,000 FEET AND HOW IT COULD HAVE BEEN DONE.. Supplied As a PDF Document. Earlier today I was delighted to find in my email inbox a copy of the “Hot off the press” PDF Ebook “The Midnight Side of The Mind” by The Paranormal Entertainer himself Paul Voodini. Now in fairness I’d have much preferred it if this book had been made available as a printed document, especially in this day and age of “Print on demand” publishers where it is both easy and cheap to have things printed professionally, however with that slight negative aside, please allow me to proceed..
For several hours now I have been sat at my computer and have already read this exciting publication from cover to cover twice in a row, and then felt compelled to go back to several sections a couple more times to take an even closer look, such is the potential for mystery, wonder and true amazement that I feel is locked within the pages of this modern day classic. In essence there is actually next to nothing new in this book whatsoever (by this I mean in terms of the basic concepts) so why do I like it so much and why would I recommend it to any serious student of Mentalism, Paranormal and Psychic Entertainment and even Hypnotists both of the Stage and Therapeutic variety? The truth is that since the days of Mesmerism and Magnetic Healing and Entertainments there were exponents demonstrating such things as Past Life Regression and the apparent miracle of giving people instant Psychic Ability. However the old, rare and often hard to find texts on these subjects which detail such activities are all written from the perspective of a true believer, they are the works of a shut eye and it is clear from the descriptions I have seen in such old works that the results obtained were usually far more of the miss than of the hit variety. It appears that Paul Voodini has independently re-created the idea of giving someone the ability to see spirits and gain so called Psychic Ability using their mind alone and has developed the routine which frankly is worth the price of this book alone to any serious minded professional mystery entertainer, namely “The Kiss of The Clairvoyant”. The routine without doubt will prove to be both eerie, fascinating, spine chilling and amazing both to those who participate and those who witness its performance. I would warn you however that there are no gimmicks to make this routine work, indeed this is the case in most all of Voodini’s routines, the truth is that the chance of failure is always there, however for those who proceed exactly as taught these occurrences will be rare and on these rare occasions those who take Voodini’s teachings to heart will still be able to produce a truly memorable and impressive piece of Psychic Style Theatre. One thing is for sure the method and approach explained by Voodini is Ten Thousand times more reliable than the shut eye nonsense printed in old texts on Mesmerism and Magnetic Healing and is clearly written by someone who has honed this approach and these methods many times for real modern day audiences in the real world, this fact alone saves you having to find out things the hard way and makes the book worth the entrance price alone. Within the pages Voodini also teaches a way to turn an audience member into a remote viewer where they are able to travel inside their mind into an audience members bedroom (or somewhere else) and with stunning accuracy describe the surroundings, the décor, objects and furniture in the room and more besides, this is the kind of routine that audiences will truly remember for years and in the wrong hands could be used by the dishonest to start a Cult Religion with ease! Voodini’s ridiculously simple approach to Past Life Regression is awesome and I say that as someone who has performed an entire 2 Hr evening Past Life Show in Theatres & Civic Halls around the Northwest of England and also as someone who has conducted numerous Regressions for one to one clients at Psychic Fairs and also in my consulting rooms. Voodini goes to great pains to state throughout this book that HYPNOSIS IS NOT USED and yet I would say that is a downright lie! That to be honest is my only Criticism of this excellent publication, and yet that criticism is small as Voodini goes to great pains to mention that Hypnosis should only be used with 100% attention to safety and when you truly know what you are doing for which I applaud him, his attention to the volunteers safety with what he terms his “Dreamscape” routines is also to be commended. However I can’t escape from the fact that if you use the “Relaxation Process” that Voodini explains, especially when it is used after the selection process experiments (or suggestibility tests as many hypnotists call them) then the fact is that the vast majority of the people WILL END UP IN WHAT IS ARGUABLY HYPNOSIS and as such the scope for Ab-Reactions and/or potential emotional side effects of a negative nature is very real indeed. To that end I would respectfully suggest that only those well versed, knowledgeable and skilled in the arts of Hypnotism should ever perform the routines generously shared within these pages by Voodini. I know this will sound like a blatant plug for my own website (and in some ways it is) but for all reading this review I’d recommend that you go to www.elitehypnosisbootcamp.com and register 100% Free so that you can get (launch date coming very soon) a 100% FREE copy of my book “Confessions of a Hypnotist” and also some FREE (5+ hrs) of Hypnosis Training Videos. These Free resources will teach you various Rapid Inductions which can be used to place people into trance and add to the theatricality of the routines that Voodini has crafted and perhaps more importantly will educate you into the ways of dealing with hypnotised individuals both for Stage and Therapeutic purposes, thus ensuring you are prepared for all potential occurrences! For those of you who do Psychic – Reading’s, I can tell you from personal experience that offering personal 1 to 1 Past Life Regression Sessions or Past Life Parties can be very lucrative indeed and the approach taught by Voodini within this book is all you’ll need to set you on the right track to profit immensely from this arena. There’s a lovely way to enable people to meet with their Spirit Guide (or for those into Native American Indians and Shamanism it could be framed as being their Protective Power Animal) that will prove memorable and rewarding g for the sitter, and whilst many may scoff in disbelief at Voodini’s approach to Psychometry I would urge any Fortune Tellers, Psychic Readers and even Mentalists of all kinds to leave their misconceptions behind and to actually give it a fair trial, I’m sure you’ll be amazed at the results. Overall this book contains many routines, along with approaches that with a little thought are easily adaptable and useable in so many other ways that I feel certain this book will inspire a whole host of new ideas, routines and miracles within the minds of everyone who reads it. It is true this book is without doubt not for the eyes of the merely curious; this material would most likely be destroyed in all but the hands of an experienced performer and ideally in my opinion one who has knowledge, expertise and experience in both Mentalism, Cold Reading and Hypnosis. This is as close as your ever going to get to REAL MAGIC or Real Psychic Style Phenomena, in closing I would say do not under estimate the power of these routines, approaches and techniques otherwise you will be doing both yourself and your audiences a grave disservice. In closing I would say that I would unreservedly recommend this publication to any serious student of the mystery arts, but would respectfully suggest that they also grab a FREE copy of my book “Confessions of a Hypnotist” and the 5+ hrs of Free videos that I am giving away in a few weeks time at http://www.elitehypnosisbootcamp.com to ensure that you are fully versed in the art of hypnosis as whatever Voodini say’s its my honest belief that the methods explained in this book will easily, rapidly and due to the non hypnosis presentational context of the routines more deeply hypnotise the volunteers than more conventional approaches. Indeed whilst your at Paul’s Site you’d be wise to invest in his other books “Reader of Minds” – http://tinyurl.com/6ax6jth (priced at £18) – “Pure Q & A” – http://tinyurl.com/6l7zk4b (priced at £18) and “The Paranormal Entertainer” http://tinyurl.com/5sum3vw (priced at £18) – Then for just over £150 you’ll have all the material you’ll ever need to work Real Miracles! NOTE: I would have given this a Ten out of Ten, But I truly do believe that to state the approaches taught are not hypnosis is a little misleading to say the least of the author. I’m sure that he sincerely believes that to be true, however I shall beg to differ on that one! Derren Brown – The Experiments – Assasin – Can Hypnosis Be Used To Kill?? 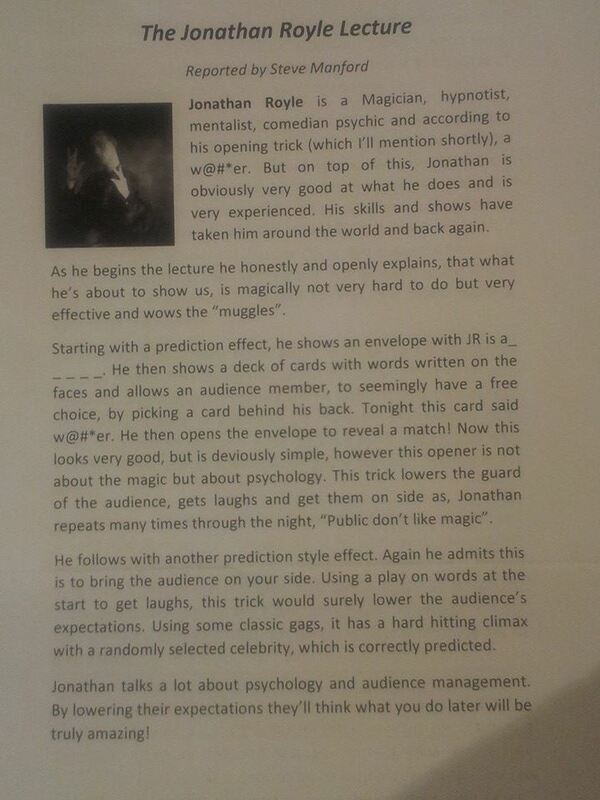 Howdy, Its Jonathan Royle here of www.elitehypnosisbootcamp.com Read on and you will discover some Insider Information About Derren Browns forthcoming New TV Shows.. I can reveal this information as I was present at some of the filming Derren Brown did in Todmorden on Sunday 25th September 2011 as I only live less than 15 minutes down the road in Rochdale and indeed got quite a lot of footage on my I-phone which I intend to upload to You-Tube before the Episode on “Luck” makes it to air so watch this space! Indeed The Todmorden Based episode on “Luck” was nothing more than a cleverly engineered Social Experiment, for example I can reveal that During his filming in Todmorden Town Hall Derren revealed that he had arranged for Comedian Jason Manford to “accidentally” bump into a Todmorden Pub Landlady and to then offer her a free show, an engineered by Derren Event which was reported as “real” in some press articles – http://derrenbrown.co.uk/blog/2011/09/magic-dog-todmorden/ in order to help the Brain-Washing Process of Todmorden Residents so they would start to Believe that if they patted or touched the dog statue in Centre Vale Park that it would make them recieve good luck into their lifes. As you’ll discover when the show on luck goes out (or at least you should as Derren told everyone in Todmorden Town Hall) this is no co-incidence, its because he engineered The Jason Manford Lucky Landlady incident to occur to help the legend of the lucky dog statue spread amongst Todmorden Residents. Also at the Town Hall Filming a Man who had patted the “lucky dog” apparently then won several thoushand pounds at the filming Derren did at Todmorden Town Hall all on the throw of a die.. In truth it had nothing to do with patting the dog statue which Derrens trickery (such as The Jason Manford event) had started to make the Todmorden Residents believe was some kind of luck giving charm, but rather a clever magic trick to ensure that this person actually won the money during the town hall filming. I can also reveal that during filming of the Fireworks display in Centre Vale Park Derren ethusiatically ran over to one woman in the front row of the watching crowd, said something to her (which was hard to hear from where I was standing) but at the same time tapped her on the shoulder which judging by the females reaction and also the fact the TV Cameras suddenly swarmed around her, I am pretty certain this tap on the shoulder and few words from Derren was highly likely a trigger for a post hypnotic command that most likely could have been given to her either earlier in the day at The Town Hall filming or at some other point during the week whilst Derren was filming in Todmorden. It was also interestig to note that there was a very rhythmic routine to the fireworks display (which I got on camera in its entirety) which reminded me of a familar piece of music, so I’d confidently predict that during the episode on luck when some of the fireworks display is shown that it will be set to a piece of familar upbeat “lucky style” music… Indeed it would not suprise me if that same piece of music was or had already been used at some other time during the filming of the show also as a Post Hypnotic Trigger – Association & Anchor on someone else who ends up apprently being suddenly lucky after having touched the lucky dog statue. I would predict that in actual fact they may well have been hypnotised (which may possibly never be shown on the broadcast show) and given a suggestion that when she hears XYZ piece of music that suddenly she’d be lucky in XYZ manner… Or perhaps the lucky incident was engineered in a similar manner to the Jason Manford incident mentioned earlier and the certain track of music anchored in a Hypnotism NLP Fashion to this incident so that whenever the person hears that music in the future it triggers off that memory association and so makes them feel positive, upbeat, optimistic and lucky. I was fortunate enough after the Fireworks display to spend some time chatting with numerous people who were present and took part in the Town Hall Filming that Derren had done earlier that day and there versions of what they saw and experienced are I am sure greatly different than the way things will actually look like when they are edited and broadcast on TV. It was also great to perform some Mentalism and magic for these peopl e over a few drinks in The Polished Knob pub in Todmorden, I did find it strange however how easily one particular female was able to be hypnotised by me… it seemed as though she’d been hypnotised before (though she could not remember such having occured) as thats usually the case when people go under so quickly… make of that what you will, but I’ll be looking out to see if she ends up being one of the people shown on screen during the “luck” show just in case! The Latest Hypnosis & Mind Control News is that British Mentalist & Hypnotist Derren Brown’s New Four Part TV Series entitled “The Experiments” starts on Channel Four soon with an Episode called Assasin, the premise of which is to use Hypnosis to turn someone into an Assasin and get them to actually attempt to kill a celebrity. Well this clearly MK Ultra & CIA Inspired “The Assasin Show” airs on Friday 21st October at 9pm on Channel Four and then there are 3 more shows on 28th October, 4th November and 11th November Respectively. REGISTER NOW FOR AMAZING FREE TRAINING VIDEOS = Yes thats right when you register for free now at http://www.elitehypnosisbootcamp.com you will be amongst the first to hear about the official launch date and to reward you for taking action and registering (which is 100% FREE) we will give you access to several hours of Unique and Amazing Training Videos teaching you Powerful Hypnosis – NLP & Mind Control Secrets and of course also revealing some of the real truths behind how Derren Brown achieves his apparent miracles. Indeed the amazing package due to be launched at http://www.elitehypnosisbootcamp.com will contain over 100 Hours of Exclusive Training Videos (plus loads of other valuable resources) turning even the novice into a Master of Mind Control and Psychological Manipulation with ease in a simple step by step manner. Indeed the information that will be made available via http://www.elitehypnosisbootcamp.com will reveal Genuine Brain-Washing – Mass Mind Control and Dark Covert NLP & Hypnosis and other Manipulative Psychological Secrets that if used with Negative Intent Could quite literally be used to turn people into “Secret Assasins” The Secrets in the wrong hands could certainly be used to get pretty much anyone to do pretty much anything against their will and even at times without any conscious knowledge or recollection of what they are doing or have done. You’ll learn Secrets Galore that Derren Brown has used both on his Stage and Television Shows and you’ll be shocked and delighted as you learn the truth behind how these apparent Mind Control Miracles are achieved. It costs nothing to register to be kept informed about the official release of this explosive package and everyone who registers now will be given 100% FREE ACCESS to around 4 hours of mind blowing Hypnosis – NLP and Mind Control Training videos so what are you waiting for register now at http://www.elitehypnosisbootcamp.com and please do pass this weblink onto all of your friends. ome of you may recall that Derren Brown did something that looked exactly the same on his “Messiah” show, anyhow my colleague had tried to perform this in the past with limited success and was asking me how it was possible to get this to work the Majority of the time and that’s why I am now posting this report. t seems that many members of the Magic and Mentalism Community are constantly arguing that Derren does not use Hypnosis and NLP techniques as often as it would appear, and at the same time many members of the Hypnosis and NLP World are believers that Derren does indeed use far more of their techniques than anyone realises. hen you have read that section of this report, I am sure you will start to realise just how often Derren does indeed use such techniques during the filming of his Television shows and often at some level in his live shows also. People can forget their names or the name of where they are going on the tube, Taxi Drivers may forget how to find somewhere – these are all low level hypnosis stunts which often can easily be achieved without the need for a formal induction process – so called “Waking Hypnosis” but are even more reliable when an induction procedure and selection testing has been done in advance as explained in the “Hero At 30,000 Feet” report below! nother thing to consider is that the wall he was facing (due to the lighting) was such that as he looked at it he would have seen the shadow of my arm reaching outwards and that in itself is a non verbal suggestion that I am going to pull him backwards in a similar manner to the dropback induction that he had witnessed on someone earlier. lso what is not obvious on the video is that as I am stood behind him I am breathing inwards, in otherwords I am taking a big deep breath inwards so that air moves towards me as does the sound of me breathing inwards move towards me and that acts as a low level sound suggestion for him to move in my direction. ll of these elements come together to make this a very reliable technique indeed, however some may wish to cheat a little more in which case you could either use someone who had been pre-hypnotised and inform them that when you coughed they would fall backwards into your arms, this cough being quite quiet so the audience don’t pick up on it and as they have not seen you previously hypnotise the person they will be amazed. 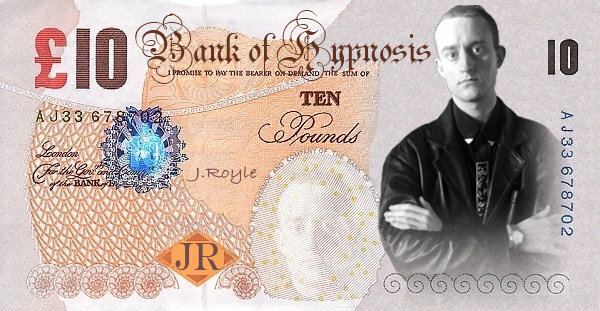 A logical context which is created and which those who apply are already in is vitally important to the success of a show such as Derren Brown’s “Hero at 30,000 Feet” – its much the same as the fact that the pre-show advertising for any Stage Hypnotist Show is just as, if not more important than any other element. So Take a Look at these four links and then you’ll see that I truly do know what I am talking about and am serious about every word stated in this report..
dverts such as this which appeared on Derren Browns own blog – http://derrenbrown.co.uk/blog/2010/04/take-part-in-my-new-show/ are used to get people to apply for a show where they are not even given any idea when applying what the show is about. nd of course no doubt off camera a suggestion was given to him whilst under hypnosis that he’d feel the absolute desire, need, want, craving and compulsion etc to enter the house and make himself feel at home. Register for free now at http://www.elitehypnosisbootcamp.com and you’ll discover how to get your hands on the worlds greatest NLP Hypnosis and Mind Control training practically for FREE.. The corporate market is said to be in decline, that is only true if you don’t shift your business model to align with where companies are still spending their budgets. In this no-filler webinar on Wednesday August 3rd, Royle will be interviewing Kennedy (UK) and Tim David (USA) to expose what corporations spend money on and how us hypnotists can cater to that need, make a grand living and have a lot of fun doing it. We’ve set up 100 seats,for 10pm UK-Time (5pm Eastern) on Wednesday August 3rd If this marketplace is something you are keen to explore and you think you’ll find this useful, register your place using the 2 boxes on the right of this page. Since this is an online presentation, you can attend from anywhere in the world, all you need is access to the internet and/or telephone.